Make the pomegranate salsa. In a mixing bowl, combine salsa ingredients. Mix and set aside for now. Preheat broiler and set oven rack about 6 inches below broiler element. Meanwhile, in a small shallow bowl, stir together spices (cumin, coriander, paprika, aleppo pepper, garlic powder, and cayenne). Pro-tip: Ovens do vary, so adjust cooking time as needed. Pro-tip for Leftovers: Refrigerate leftover blackened salmon in a glass container with a tight lid. In my book, this blackened salmon makes the perfect cold lunch the next day. Throw it in with a favorite salad and you’re good to go. You can bring it a little closer to room temperature, but I would not recommend reheating. Pro-tip: Option for Pan-Seared Blackened Salmon. 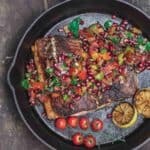 Making blackened salmon in a pan can be tricky and requires a little more technique but is doable. You can season the salmon the same way. And it is best to use center-cut salmon with skin on. It’s very important to start with a hot pan, otherwise the salmon will stick and it will be nearly impossible to flip. Preheat a cast-iron skillet with a thin layer of extra virgin olive oil over medium-high until oil is shimmering but not smoking. Transfer salmon to a tray lined with paper towel to drain all excess oil. Let it rest for a couple of minutes before serving. Again, serve with a squeeze of lemon juice (from those grilled lemons) and pomegranate salsa.